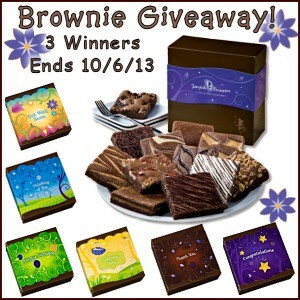 Home » Featured » Gourmet Brownie Box Giveaway – 3 Winners! 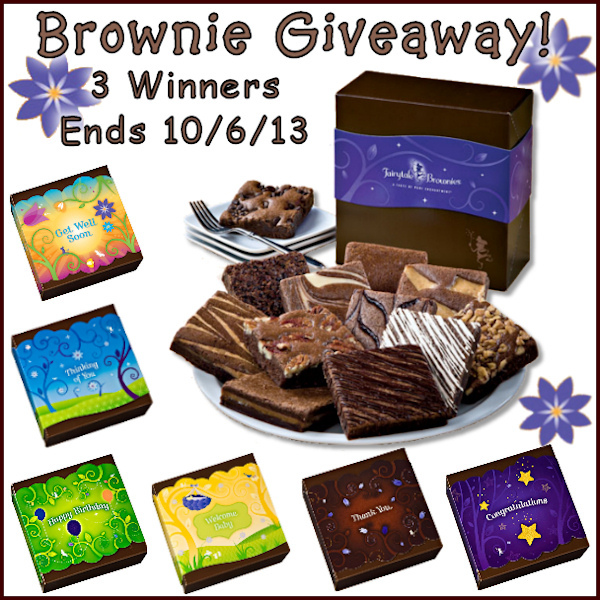 Gourmet Brownie Box Giveaway – 3 Winners! There is something so warm and comforting about a brownie – especially a delicious gourmet brownie! 3 very lucky winners are going to receive a Gourmet Brownie Box, filled with 12 brownies. 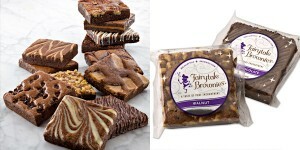 The brownies come in All About Gifts and Baskets most popular flavors – letting you sample the best of the best. Their brownies come in 12 amazing flavors – Caramel, Chocolate Chip, Cream Cheese, Espresso Nib, Mint Chocolate, Original, Peanut Butter, Pecan, Raspberry Swirl, Toffee Crunch, Walnut and White Chocolate. Your only problem will be deciding which one to try first! And, when you order a brownie box, you can choose the packaging – from the classic Fairytale, to Get Well Soon or Welcome Baby, these brownies make the perfect gift! Will YOU be one of the lucky contest winners? If you’re over 18, and live in one of the continental 48 states, you could be eating one of these tasty brownies soon. (You know, or sending a few to your favorite blogger…) =) Good luck! I want the Halloween brownies! My kids would think these are a lot of fun! Since I have never tried these brownies my favorite would be the Gourmet Brownie Sampler. I would love to try them! I would have loved to get the brownie get well sampler when I was in the hospital. Way better than the food they served there. The Belgium Chocolate covered graham crackers sound delicious too! Thought in have never tried these brownie before, the majestic Burgundy Cookie & Brownie Tower looks over the top amazing and I think the kids would really like the brownie sticks favors! Thought in have never tried these brownie before, the majestic Burgundy Cookie & Brownie Tower looks over the top amazing and I think the kids would really like the brownie sticks favors. The Classic Dipped Brownie Favor Stix look so good. I also want to try the Belgian chocolate graham crackers! Yum! Wow, what a hard choice….I think I would like the Halloween one. Or maybe the gourmet one. Such a tough choice. Thanks so much for the chance to win! These look so good! I think the Halloween brownies are so cute!! I love the Majestic Burgundy Cookie & Brownie Tower! It has everything in it! The Regal Brownie & Cookie Tower sounds great. I especially like the caramel pecan and toffee chocolate chip brownies. I think that the Majestic Burgundy Cookie & Brownie Tower looks delicious. It would make an excellent Christmas present for anyone.